I have always enjoyed the Oran Mor series of lunchtime plays in a Play, a Pie and a Pint. Even if the Scotch pies rather than the old steak pies have been a bit of a disappointment for me the plays this season have been excellent. The last play of this run I'd pencilled in at the start as one to try to catch, Dalgety by David Greig. It was originally written for the strand of political theatre for Theatre Uncut before being brought here. John Bett and Lesley Hart play two officers in a quiet Fife police station trying to finish off their shift to get home to watch the Olympics on TV or to enjoy a lonely bottle of wine. When a naked rambler-type character turns up at the station with a dead deer the world outside changes in a surreal way. The rambler's naked clan set up camp in the land which used to be the Tesco car park but is now a verdant land with the bushes hanging heavy with brambles and dance around as one of them gives birth. Once it is clear that the next shift aren't coming in the older John Bett tries to hold on to law and order whilst the more empathetic Hart goes out to speak to the people. When she decides to join them and comes back on stage completely naked a shocked "ohhhh!" comes from the audience of Kelvinside types caught by surprise. She carries it off with great confidence, relaxed and at one with nature (her dowdy wire-rimmed specs the only thing binding her to her former self). I thought it played about well with our perceived spirit of togetherness we had during the Olympics from the day of the opening ceremony, the campfires they can see from hill to hill telling you that it has spread throughout the land. It was humorous and thought provoking with the avuncular John Bett and an excellent, brave performance by Lesley Hart. I believe it is going to the Edinburgh Fringe if you don't catch the end of this run in Glasgow. 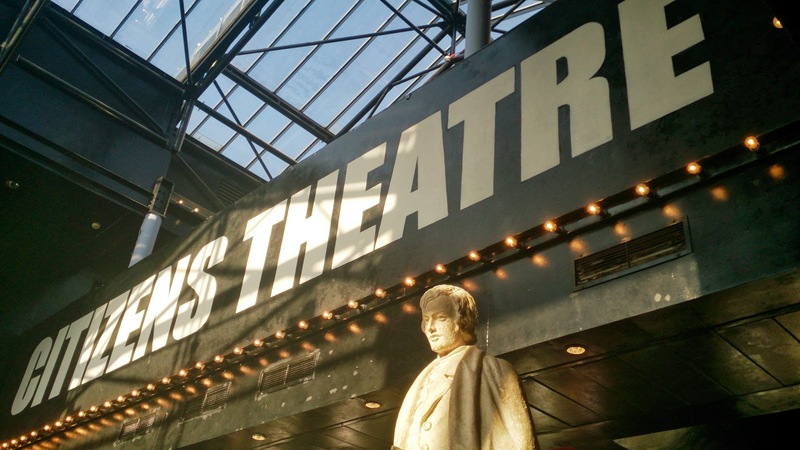 When trombonist Rico Rodriguez cancelled his Friday night gig at Oran Mor as he has a chest infection we took the chance to go and see two short plays by Caryl Churchill which are on this week at the Citizens Theatre. I've never seen any of her work before but would look out for her again after this. As a child we used to come to the Citizens a lot. They used to do a free preview showing on the day before each run, and we often went and queued up outside to get into these. I think they've revived this now with a sale of 50p tickets the day before each preview show, which is good but means two trips to get the cheap tickets. This kind of excludes some people like my family and me who 30 years ago would all have had to make 2 return bus trips from Maryhill to take advantage of this. Just a thought. Far Away was performed on a beautifully constructed stage set, with excellent music from Scott Twynholm. In short episodes it portrays a dark, imagined future where there is an Orwellian perpetual war going on. A lot of the darkness is from the ambiguity in the air during the piece. In under an hour we are taken from a rural setting where frightening happenings are witnessed in the barn by a relative staying for a while, she is then later seen working in a hat factory, and later the hats are paraded, but on prisoners awaiting "judgement". (The hats, by students and teachers from North Glasgow College, on parade were stunning by the way). Then we are later on back out at the farm where loyalties are doubted and the shifting allegiances of nature and even darkness are debated. The second play Seagulls has another surreal world in which an ordinary woman working in M&S reveals she has telekinetic powers and then heads on a world tour with her pal as her manager. An incredibly original and imaginative moral tale. Her very ordinariness as the main character really stands out and there were excellent performances throughout. 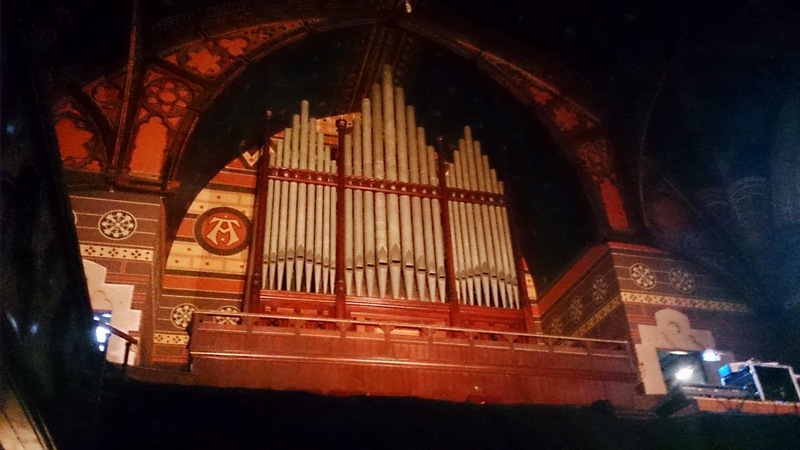 On another note I was briefly in Cottiers Theatre to hear a late night reading by Christopher Brookmyre as part of the West end festival. Since I was last in that building they've really come on apace with restoring the church hall. The roof is now all exposed, they've re-instated the huge church organ and I believe the bell in the tower. Nice venue.